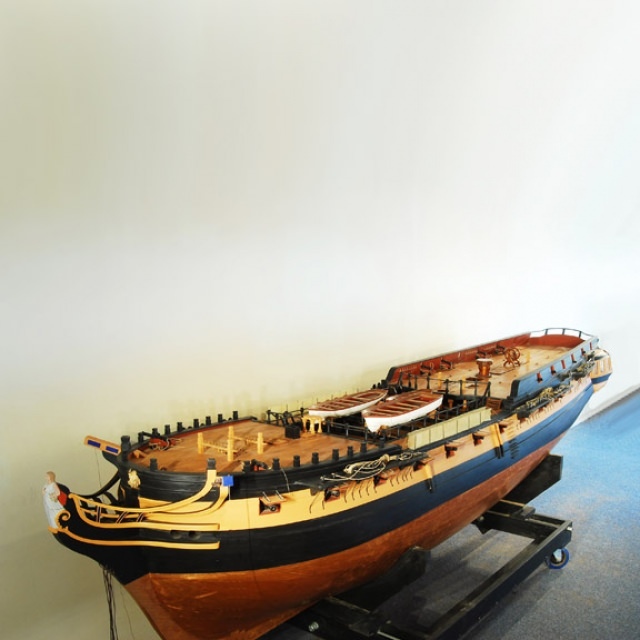 A 1:48 scale model of HMS Phoebe, held in the collection of the National Maritime Museum. 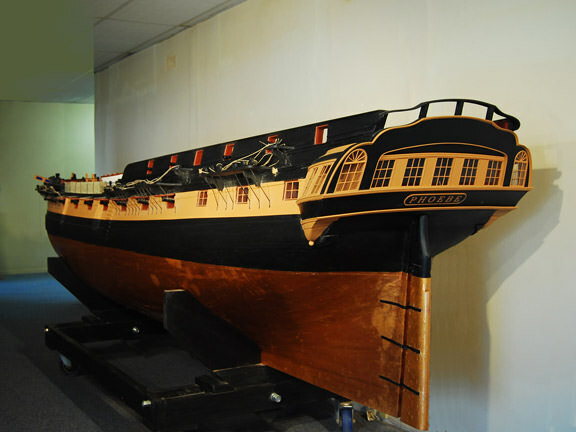 This model shows the ship in a black and white colour scheme, which didn't come into use until about 1815, which dates the model as being made after 1815. As a Phoebe Class ship, HMS Doris would have been identical. Notice the crew's hammocks in the nettings above the forecastle and quarterdeck bulwarks and in the middle part of the ship, by the gangways linking the quarterdeck and the forecastle. There were two reasons for placing them there: Firstly, to air them and secondly, in action, they provided a degree of protection from incoming small-arms fire. Port Quarter view, showing the ship in a peacetime appearance, with the gunports aft replaced by windows. If the ship was at risk of going into action, the guns and their carriages would have been brought up from the hold where they were stored. Again, as a Phoebe Class ship, HMS Doris would have been identical, aside of course, from her figurehead. Isn't that the origin of the saying "Show a leg"? According to Cpl. Jones it was! Excellent again Bilgerat. You really should put these stories into a book. Not necessarily Busyglen. On some ships, a blind eye was turned to women volunteering for service at sea. There were about a dozen women serving aboard ships which were at Trafalgar. Thanks also from me. I never fail to be interested in these stories. Perhaps I was a male in another life! Once again Bilgerat thank you for a very interesting and good read. The contract for the construction of HMS Doris was signed on 24th May 1794, as the French Revolutionary War was getting underway. The war itself had broken out in February 1793 and by the time William Cleverley signed the contract with the Navy Board to construct the ship, the Reign of Terror was soaking the soil of France with the blood of tens of thousands of French men, women and children of all social backgrounds. The ship's keel was laid at Gravesend during June of 1794 and the ship was launched into the great River Thames, hull complete, on Monday, 31st August 1795. After her launch, HMS Doris was taken to the Royal Dockyard at Woolwich and was fitted with her guns, masts and rigging and her hull was coppered. In addition to this, in September 1795, she received her first commander, Captain the Honourable Charles Jones. 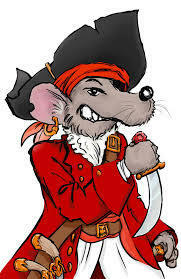 He stood by the ship while she took on her crew and was loaded with her stores. On completion, HMS Doris was a ship of 917 tons, She was 118ft 11in long at her keel, 142ft 6in long at the gundeck and 38ft 1in wide across her beam. Her hold below the orlop deck was 13ft 5in deep and she drew 10ft of water at the forefoot and 14ft 6in at the rudder. The ship was armed with 26 18pdr long guns on her gundeck, 8 9pdr long guns and 6 32pdr carronades on her quarterdeck with 2 9pdr long guns and 4 32pdr carronades on her forecastle. In addition to these guns, she was also fitted with a dozen or so half-pounder swivel guns mounted along her upper handrails and in her fighting tops. Construction at Gravesend had cost £15,080 and fitting her out at Woolwich added a further £9,076 to the bill for the ship. Captain Jones took command and commissioned the ship in June of 1795 and by November that year, the ship was operating in the English Channel and the Western Approaches as part of the Channel Fleet, then commanded by Vice-Admiral Sir Alexander Hood, the 1st Viscount Bridport. She was engaged in the typical duties of a frigate, those of patrolling, enforcing the blockade of the French channel ports and acting as the eyes of the fleet, scouting ahead of the main fleet when it was at sea and investigating sightings of strange sails. At about this time, the French were in the advanced stages of planning an invasion of Ireland. With the Spanish having changed sides and the border with Spain accordingly stabilised, the British were the only really dangerous opponent they faced. In Ireland, opposition to British rule, which had been going on for centuries had been galvanised by the French Revolution in 1789. The British had not helped their cause by imposing the Penal Laws which discriminated against the Catholic majority in Ireland. This in turn led to the rise of the non-sectarian Society of United Irishmen, which was dedicated to replacing British rule in Ireland with a republic. Originally a non-violent purely political movement, the Society was forced underground in 1793 when it was banned by the British. Two of the Society's leaders had gone to France to try to elicit French support. The British could ill-afford to mount a military campaign in Ireland to try to repel any French invasion, so some of the Penal Laws were repealed later in 1793. The French for their part had long cherished the idea of expelling the British from Ireland, calculating that it would be a major blow to British prestige and could be used as the springboard for an invasion of Britain. These ambitions had until now, been hampered by a number of things. other campaigns being fought, the terrible state of the French Navy following the Revolution, the tactical defeat at the Battle of the Glorious First of June being the main obstacles. By 1796 however, the situation had stablised somewhat. The aforementioned peace with Spain, the end of the civil war in the Vendee Region of France and the stabilisation of the political situation with the French Navy had convinced the Revolutionary Goverment that the time was right to attempt an invasion of Ireland and preparations got underway with a view to launching the campaign over the winter of 1796 into 1797. The Society of United Irishmen promised the French Government that they could raise an army some 250,000 strong to support any French force which managed to land in Southern Ireland. On 15th December 1796, the invasion fleet left Brest, bound for Ireland and were duly spotted by the blockading British frigates, which included the 44 gun Razee Heavy Frigate HMS Indefatigable, commanded by the famous Captain Sir Edward Pellew. Disaster had struck the French force as soon as they had left Brest. Bad weather, navigational errors and confused signalling had left the fleet scattered across the approaches to Brest by the following day. The French commander-in-chief, General Hoche had embarked in the frigate Fraternite, which had managed to become isolated from the rest of the force. The French 74 gun ship Seduisant had run onto rocks and had been wrecked with the loss of over 600 men. On 19th December, the French had finally got their act together and had begun to head for Bantry Bay in the far south-west of Ireland. The Fraternite was still up to this point missing. What the rest of the French fleet didn't know was that the Fraternite had headed west across the Western Approaches and was cris-crossing them looking for the rest of the fleet. What the French also didn't know was that they were heading out to sea into the teeth of the most violent storm in living memory. The French, leaderless, had arrived in Bantry Bay on 21st December. The French called a council of war amongst the remaining commanders and decided to land on the 24th, just as the storm was really beginning to bite. During the night of Christmas Eve of 1796, the storm broke. The French ships were literally blown off their anchors, out into the Atlantic Ocean. Many of the French ships were destroyed in the storm, lost with all aboard. One of the French 74 gun ships, the Droits de L'Homme became involved in a running battle in appalling weather against Pellew's HMS Indefatigable and the 18pdr-armed 36 gun frigate HMS Amazon and was driven ashore with HMS Amazon on the coast of Brittany and both ships were wrecked, while it was only Pellew's extraordinary seamanship which saved his own ship from suffering the same fate. HMS Doris was one of the British ships which had remained at sea despite the storm's ferocity and had spotted the Fraternite desperately searching for the rest of the invasion fleet. Captain Jones had chased the enemy ship far out into the Atlantic, unaware of the importance of her passengers, before returning to her station in the Western Approaches. With the invasion fleet scattered in the Western Approaches, the individual French ships began to head back to France. By early January 1797, Lord Bridport had managed to get to sea with his Channel Fleet. Captain Pellew had managed to get word to him of the French invasion fleet, but the same storm which had put paid to French invasion plans had also prevented Bridport from putting to sea until now. On her return from her chase of the Fraternite, HMS Doris rejoined the Channel Fleet and became part of the scouting force of frigates. On 7th January 1796, HMS Doris was operating in company with the 12pdr armed 32 gun frigate HMS Druid and the 18pdr armed 32 gun frigate HMS Unicorn when they came across and captured the French transport ship La Ville de Lorient of 28 guns. This ship was originally the French East Indiaman Bretagne, built in 1787 and purchased by the French Navy in December 1793. She had been part of the invasion fleet and was trying to return to Brest when she was caught by the British frigates. Although the French operation ended up being a dismal failure, from the French point of view, there were encouraging signs. The French had managed to get an invasion fleet to within spitting distance of the Irish coast and back without being actually intercepted by the Royal Navy's Channel Fleet. On 7th May, HMS Doris captured the French brig-corvette La Cigne of 14 guns off the Isles of Scilly. On 22nd July while still operating off the Isles of Scilly, in company with the 18pdr armed 38 gun frigate HMS Apollo, she assisted in the capture of the French ship-corvette La Legere of 18 guns. This vessel was taken into the Royal Navy and became the 18 gun ship-sloop HMS Legere. In the meantime, Captain Jones' father had died. Captain Charles Jones inherited his father's title and became the 5th Viscount Ranelagh on 20th April 1797. Further success evaded the ship for almost a year until 15th July 1797, when in company with the 18pdr armed 32 gun frigate HMS Galatea, she captured the French privateer Duguay Trouin of 22 guns and 127 men, four days out of Nantes. After being sighted by the British frigates, the Duguay Trouin had attempted to flee, throwing her guns overboard in an attempt to gain more speed. It had been to no avail and faced with the overwhelming firepower possessed by the British ships, her master had had no choice but to surrender. Also in July 1797, the two frigates recaptured two Portugese ships previously captured by the French, the Nostra Senoro de Patrocinio e Santa Anna and Nostra Senoro de Conceicao e Navigantes. On 8th September, the ship captured the 20 gun French ship-corvette Le Fabius. This success was followed on 10th October when HMS Doris captured the 16 gun French privateer La Brune. On 26th August, HMS Doris captured the Spanish privateer El Derrepente. In the meantime, trouble had flared up once more in Ireland. The Society of United Irishmen had been planning a further uprising, once again to be supported with French help. In May 1798, an uprising had spread across Ireland and the French sent a small force of 1,150 troops as the advance party of an army to be landed later. French plans had been disrupted by the uprising starting earlier than originally planned. The Society had had to launch it earlier because they had been thoroughly infiltrated by British spies and the majority of their leadership had been arrested. By September however, it was all over. The combined Irish and French force had been defeated at the Battle of Ballinamuck on the 8th September and had surrendered. The French however, were unaware of the defeat and on 16th September 1798 had dispatched a force of 3,000 soldiers in the 74 gun ship of the line Hoche and eight frigates under Commodore Jean-Baptiste-Francois Bompart. The British, having failed to intercept the earlier force, were now more alert and Bompart's force was spotted leaving Brest by Captain Richard Keats in the 18 pounder armed 38 gun frigate HMS Boadicea. Keats also had under his command the frigate HMS Ethalion and the brig-sloop HMS Sylph. He ordered that HMS Ethalion and HMS Sylph shadow the French force while he went to summon help from Lord Bridport's Channel Fleet. HMS Doris was by now part of Commodore John Borlase Warren's force on the Irish Station and after having figured out that the French were heading for Ireland. Captain George Countess in HMS Ethalion was soon joined on 18th September by a further frigate, HMS Amelia and on the 20th, by the 24pdr-armed Razee Heavy Frigate HMS Anson. On the 23rd September, Captain Countess sent HMS Sylph to warn Commodore Warren of the French force approaching his station. The British had correctly guessed that Bompart's force was headed for Lough Swilly, based on intelligence gained from their Irish prisoners and Warren took his force there, hoping to intercept the French. Bonpart's force arrived off Tory Island at the mouth of the Lough on 10th October 1798 and anchored for the night, intending to land their troops the following day. They were still unaware that the uprising had been crushed by the British. On the morning of the 11th October, Bompart awoke to find strange sails on the horizon. To his horror, he realised that he was trapped against the shore and that an overwhelming British force was bearing down on him. Commodore Warren's squadron had been joined by the ships under Captain Countess. Bompart immediately decided to abandon any plans to conduct a landing and decided to head out to open water to escape the British. The Battle of Tory Island ended in a French defeat with seven French ships being captured and the French suffering losses of 700 men killed or wounded and 2000 men being taken prisoner. HMS Doris unfortunately missed the battle as Commodore Warren had ordered Captain Lord Ranelagh to scout along the Irish coast and warn British garrisons of the French approach. The French flagship, the 74 gun ship Hoche had been captured in the battle in which she had been badly damaged. On her return to Warren's squadron, HMS Doris's next task was to tow the damaged Hoche back to Lough Swilly, taking over the tow from the damaged HMS Robust. The Hoche was subsequently taken into the Royal Navy and was renamed HMS Donegal. HMS Doris spent the rest of the year off Ireland, but in March 1799, returned to Plymouth where she was refitted. Once her refit was complete, HMS Doris resumed her role in the blockade of the French channel ports. On 20th March 1800, a vessel called the Mercury arrived at Falmouth. She was a merchant vessel which also possessed a Letter of Marque; a document allowing her to prey on enemy merchant shipping without the risk of being accused of piracy. The Mercury had originally been en route from Leghorn in Italy to London with a cargo of silks when she had encountered and captured a French privateer of 12 guns. She had sent aboard a prize crew and had taken aboard a number of French prisoners. Two of her seamen had released the prisoners and with them had seized the ship and had been heading into the French port of Lorient when the ship had encountered and been boarded by men from HMS Doris and HMS Alcmene. On 14th July 1800, HMS Doris recaptured the brig Bellona, which had been en-route from Galway to Londonderry with a mixed cargo of kelp, bread, oats, herring, hides, rosin and flannel when she had been captured by the French privateer La Ruse of 14 guns and 75 men. On 16th September 1800, HMS Doris in company with the ex-French frigate HMS Minerve (38) when she captured the Spanish vessel El Rey Carlos off Corunna, laden with a cargo of Indigo, Sugar and Cochineal. That vessel was sent into Plymouth with a prize crew, arriving on 25th. On 5th October 1800, HMS Doris left Cawsand Bay, Plymouth, bound for Torbay in company with HMS Prince (98), HMS Prince George (98), HMS Barfleur (98),HMS Neptune (98), HMS Edgar (74), HMS Elephant (74) and HMS Excellent (74). On 26th November, HMS Doris recaptured the Countess of Bute, registered in Glasgow. That ship had left Newfoundland with a cargo of barrelled salmon oil in a convoy bound for Naples. She had been separated from her convoy in a storm off the Grand Banks on the 10th and had been captured by the French privateer La Brave of 36 guns on the 19th. The Countess of Bute arrived safely at Plymouth with a prize crew from HMS Doris aboard on 6th December. HMS Doris had returned to Plymouth by mid-December 1800. On 20th December 1800, while the ship was moored in Plymouth Sound awaiting orders, Lord Ranelagh died suddenly aboard HMS Doris after a short illness. He had been 39 years old. He had been in command for five and a half years and under his command, she had been a successful frigate with a reputation for being a well-run and happy ship. Lord Ranelagh's place in command of the ship was taken by Captain John Halliday. Lord Ranelagh was unmarried at the time of his death and his title passed to his younger brother, Thomas Jones. HMS Doris was Captain Halliday's second command. His first command had been the ex-French 28 gun, sixth rate frigate HMS Nemesis, which he had commanded since her capture in 1796. He remained in command of HMS Doris until May 1801, when he was replaced in command by Captain Charles Brisbane. Brisbane was a popular, well-respected and experienced commander who had first held command in the brig HMS Tarleton of 14 guns in 1794. His previous appointment had been in the 74 gun third rate ship of the line HMS Carnatic. Captain Brisbane took his ship to join the blockading force off Brest. In July 1801, HMS Doris was in company with the 18pdr-armed 40 gun frigate HMS Beaulieu, when they spotted the French 20 gun ship-corvette Chevrette lying under a shore battery in Camaret Bay. The French considered that given the strength of the shore battery, the Chevrette was as secure as she would be if she was in the harbour at Brest. Nevertheless, Captain Brisbane resolved that the French vessel would be taken, despite the difficulties and the risk. His reputation had gone before him, so when he called for volunteers for the mission, there was no shortage. The mission was to be commanded by Lieutenant Woodley Losack, who had been sent from the Channel Fleet's flagship, the mighty HMS Ville de Paris of 110 guns, specifically to command the mission. On the night of 20th July, the force comprising of all the boats from HMS Doris and HMS Beaulieu, set off. Things went wrong when the boats became separated as a result of the lead boats pulling ahead. The rear-most boats decided to return to the ships when they lost sight of the others in the darkness. The lead boats meanwhile reached the entrance to Camaret Bay, where they lay at their oars waiting for the others to catch up. When they had failed to arrive by daybreak on the 21st, since the operation needed to be conducted in darkness, the leading boats also decided to return to the ships. Unfortunately, they had been spotted by the French and although they had not been fired upon by the enemy, the French decided to lay a trap for the British in case they decided to try again. La Chevrette weighed anchor and sailed about a mile and a half further into the bay. There, the French crew was reinforced by soldiers, bringing the total number of men aboard to 339. In addition, La Chevrette was now moored under a larger, more heavily armed shore battery. The shore battery itself was augmented by the throwing up of temporary earthworks. Arms and ammunition were brought on deck and the ship's guns were loaded almost to their muzzles with grapeshot. The French moored a guardboat, fitted with 2 36pdr long guns at the entrance to the bay and to encourage the British to try to attack them again, hoisted French colours over British ones. This was seen by the British frigates, which by now had been joined by a third ship, the ex-French 38 gun frigate HMS Uranie. It had the desired effect and the British were determined to capture La Chevrette. During the 21st July, the force was joined by the pinnace and barge from HMS Robust (74), bringing the total number of boats to 15 and the total number of British officers and men committed to the attack to about 280. At about 21:30, the British launched a second attempt, again commanded by Lieutenant Losack. Shortly after they departed from the frigate position, Lieutenant Losack took his own and five other boats to chase down an enemy boat, presumed to be the lookout boat posted by the enemy to watch for their approach. This was the right and proper thing to do since the British had already lost the element of surprise. The remaining boats pulled slowly ahead or lay on their oars waiting for their commander to return. When he did not return as soon as expected, command of the mission devolved to Lieutenant Keith Maxwell of HMS Beaulieu and he, mindful of the advancing time and the six miles they had to go to reach the enemy vessel, ordered that they pull ahead regardless. By now, the force had been reduced by a third, so Lieutenant Maxwell issued new orders, redeploying his men to make better use of the reduced resources now available to him. At about 01:00 on the 22nd July, the force sighted La Chevrette, which opened fire with grapeshot and muskets. They were joined in this by musket fire from ashore. The British then rushed at the enemy ship. HMS Beaulieu's boats under Lieutenant Maxwell assisted by Lieutenant James Pasley and Royal Marine Lieutenant James Sinclair attacked La Chevrette;s starboard bow and quarter. One of HMS Uranie's boats commanded by Lieutenant Martin Neville, one of HMS Robust's boats commanded by Mr Midshipman Robert Warren and one of HMS Doris' boats commanded by Lieutenant Walter Burke attacked the port bow. The attack was met with fierce resistance from the French, armed as they were with muskets, pistols, tomahawks, pikes and swords. The French attempted to board the boats. 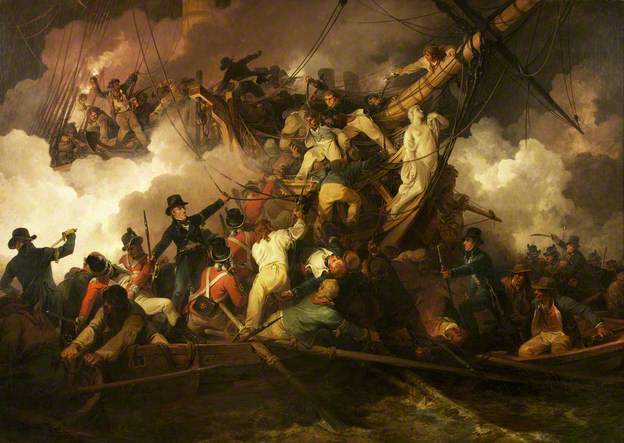 In the face of brutal hand-to-hand fighting in which no quarter was asked or given, the British sailors, marines and officers had to literally hack their way through the packed mass of French sailors and soldiers to reach their objectives. Despite being outnumbered three to one, the British quickly took control of the French ship's yards and within three minutes of getting aboard La Chevrette, had released all three topsails and cut the anchor cable. As soon as they saw their ship getting underway, many of the enemy jumped overboard while others threw down their weapons and fled below. This enable the British to gain control of the quarterdeck and forecastle. By this point, almost five minutes had elapsed since the British had first boarded the French vessel and her decks were covered with dead bodies and her scuppers were running with the blood of the dead and wounded. For a while, some of the enemy continued firing their muskets through the hatches, but they were soon overwhelmed by the British and forced to surrender. As they sailed their prize out of the bay, the British were fired upon from the batteries ashore, but to no avail. They had done it. They had overwhelmed a force three times their own number and had stolen a fully armed and manned French warship from under the guns of a powerful shore battery. This did not come without a cost however. Royal Marine Lieutenant James Sinclair and Midshipman Warren together with seven seamen and two marines had been killed. Lieutenants Martin Neville and Walter Burke together with Masters Mate Mr William Phillips, Midshipmen Edward Crofton, Edward Byrn and Robert Finnis together with 42 seamen and 9 marines were wounded. Lieutenant Burke of HMS Doris died of his wounds later. La Chevrette's loss had been far greater. In ten minutes of frenzied, close-quarter fighting, 92 Frenchmen had been killed and 62 wounded. The dead included her captain, two of her three lieutenants, an army officer and three midshipmen. There were many tales of individual bravery in this short, sharp action. Lieutenant James Sinclair of the Royal Marines, killed while defending Midshipman Crofton of HMS Doris, who in turn had been wounded twice while trying to get aboard La Chevrette. Mr John Brown, Boatswain in HMS Beaulieu who had got into the stern cabin on La Chevrette, only to find the door boarded over. After trying and failing to force his way through, he then climbed over the stern onto the quarterdeck and found himself in the midst of a mass of enemy sailors. He cleaved his way through them and fought his way along the length of the ship to the forecastle, which was where he was supposed to be, where he then supervised the cutting of the anchor cable, in addition to repelling French attempts to retake the forecastle. Henry Wallis, Able Seaman in HMS Beaulieu, fought his way aft to the Steering Wheel and despite being severely wounded and bleeding badly, steered the ship out of the bay under fire and out to sea. In June 1802, HMS Doris paid off at Plymouth for a refit. Captain Brisbane's next command was the 36 gun frigate HMS Trent. HMS Doris didn't recommission until February 1803, when Captain Richard Harrison Pearson took command. Again assigned to the Channel Fleet, on 18th May 1803, she captured the French privateer lugger L'Affronteur of 14 guns. On 24th June, she captured the four gun privateer schooner La Pelagie. In October 1804, Captain Pearson handed over command to Captain Patrick Campbell. On 20th January 1805, HMS Doris arrived in Quiberon Bay to pass on news to the squadron blockading Brest that the Rochefort Squadron of the French Atlantic Fleet was preparing to depart as part of the campaign which eventually culminated in the Battles of Cape Finistere and Trafalgar. After finding that the squadron had already left, she anchored for the night and departed from the bay in the morning. In the face of worstening weather, Captain Campbell decided to return to the bay to take shelter. On the way back in, HMS Doris struck what is now known as Diamond Rock in the Benequet Passage, which at the time was submerged. Her crew quickly managed to get her off the rock, but she was badly holed. They effected a form of damage control when they stretched a sail over the bottom of the ship, partially plugging the holes, stemming the flow of water into the lower hull enough to be able to pump it out and bring the flooding under control. Later that day, the armed schooner HMS Felix arrived, bringing news that the Rochefort Squadron had sailed. Captain Campbell felt that it was vital that the news reach the Channel Fleet, so he ordered that his ship set sail and get under way, despite her damage. As the ship got underway, the hull around the holes collapsed under the strain and she began to sink. Captain Campbell ordered that the ship be abandoned, her crew being evacuated to HMS Felix and a passing American schooner. Aware that a powerful French squadron was now at sea, Captain Campbell ordered that HMS Doris be burned and her crew set fire to her, to avoid her being captured by the French. In the subsequent court martial, held aboard HMS Gladiator in Portsmouth Harbour, Captain Campbell, his officers and crew were acquitted of any wrongdoing. The Court Martial Board found that the loss of the ship was due to the incompetence of the French pilot, M.Jean le Gall and he was subsequently reprimanded. HMS Doris is set on fire to prevent her use by the enemy, 21st January 1805.